This flower signifies deep love and devotion whereby men harvest the flower on daring steeps and fatal climbs to prove love and to show occasions of devotion. It’s synonymous with the alpine terrain, and those of the Alps find it a flower of purity that instills a great sense of patriotism with its meanings. The nations bound to this flower’s symbol includes regions in Austria, Germany and Switzerland. It’s short life span and remote habitation have inspired the folklore of Alps inhabitants to signify the Edelweiss with national prestige. It is Switzerland’s national flower. 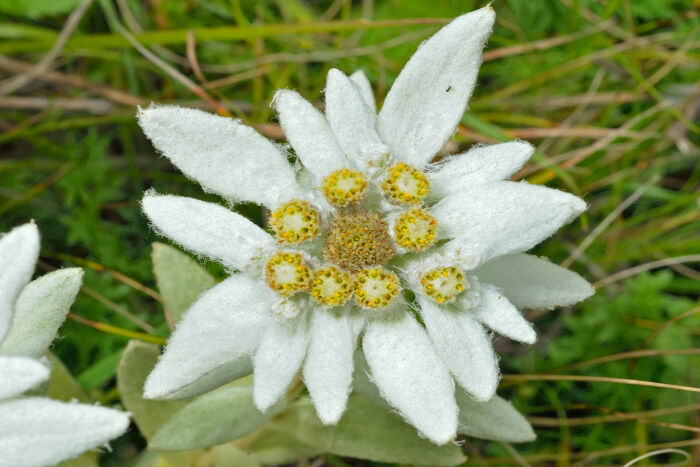 The Edelweiss is a flower that means notoriety in its complete essence. It’s prized where it naturally grows and is created to be a symbol by its local region because it’s only obtained by a few when it lies waiting in its natural habitat. It, therefore, captivates the symbolic qualities of adventure and great sacrifice. 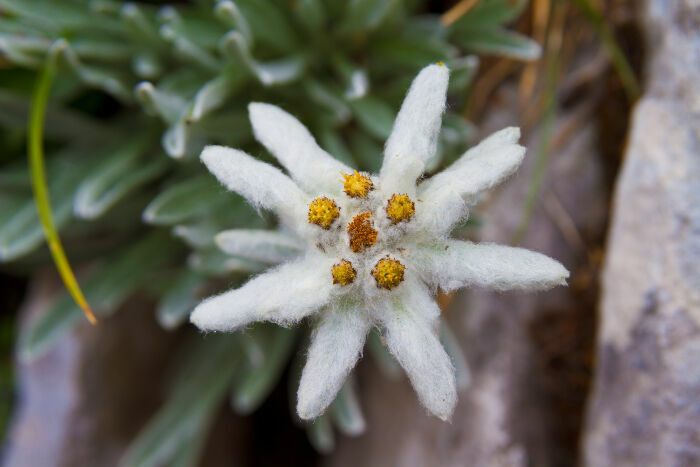 When speaking of the etymology of the Edelweiss flower, we’ll inevitably come by the name and meaning of Leontopodium aplinum that is characterized as a German mountain flower and what mountains symbolizes. It prefer heights of 1,500 to 3,000 meters on incline. 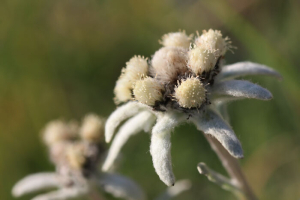 The Edelweiss flower is also a part of the daisy and sunflower family with non-toxic properties in its makeup. This flower has tomentose, a wooly appearance of white hairs, on its leaf and flower structures that creates the flower’s hairy and silvery character. It grows to heights of 16 inches and develops its flower into a double-star formation between the months of July and September. These patterns make it highly recognizable as a birth flower. Though subtle in appearance, the Edelweiss’ color has symbolic meaning as much as the entire flower itself has. The actual German translation of the word, “Edelweiss,” literarily means noble and white. Surely, this is a brief color meaning as a description. The flower’s sense of nobility is the most profound in the Edelweiss’ entire symbolic meaning. 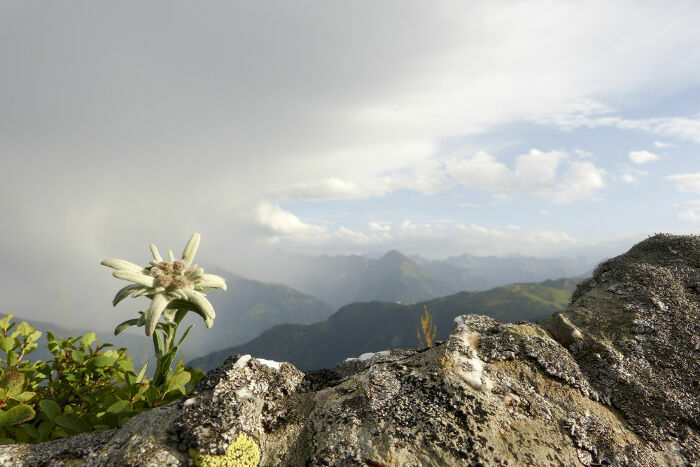 Roughly dozens of people die yearly in climbs and expeditions for this blooming daisy variety. Its nobility is on the line yearly with 50 being the most to have fallen to their deaths in pursuit of this wild blossom. Snow flower is the common attributed name the Edelweiss flower will go by. Its love for high altitudes gives it access to increased levels of ultraviolet radiation from the sun. This is a perennial plant that flourishes in calcareous gorges for a lively stint of 3 to 10 years respectively. 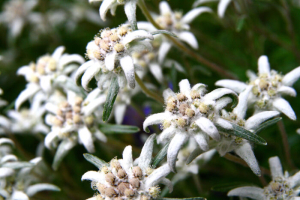 There are a collection of medical uses that the Edelweiss flower finds itself useful for. Collectively, the flower is great in mediating the presence of normal aging, abdominal pain, aerophagia, amnesia, Alzheimer’s, allergic reactions and alcoholism alike. Of these, an upset stomach is more commonly remedied with the Edelweiss flower. There currently are legal limitations that deny the legal right to pick this flower in most of the regions where it’s now left to grow wild. The plant is said to have anti-aging proponents. The popular song, that you likely heard on “Sound of Music” is not a national tune; it was written specifically for the movie. To prevent its extinction, the Edelweiss has been planted in accessible areas consisting of lower altitudes. 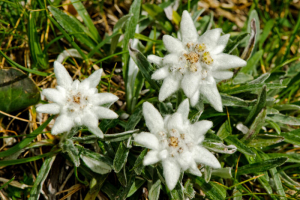 The Edelweiss is a token of love, and it is also the name of a beer maker in Austria. Should the man be brave and stout, an Edelweiss might be the right flower to profess his love. This flower can be a great symbol of love when daring men take hold of the mountains and elevate there way through dangers of falling and inclement weather. The lucky women found to be the reason for such an occasion will surely know the honor of the man seeking to impress her. This flower could also have been given to soothe the body of diphtheria or tuberculosis. When taken as a tea, these ailments are given relief and was a gesture of good faith had it been giving to you during sickness. A plant that is of honorable qualities, the Edelweiss, which makes its seeker climb and its lover woo. Its nobility is found in its upbringing: rare and where only few can surely get to. Don’t change a thing on this no-doubt literal translation from German. It adds to the lyric character of the entrancing subject matter.